Everyone made it! Now began the arduous journey to find their next meal. “Come on, you can do it,” shouted one of the leaders, hoping his encouraging words would help motivate the stragglers shuffling very slowly up the path. After walking three days with very little to eat or drink, a young mother carrying her infant son on her back, suddenly began to shriek pointing off to the left side of the dirt road. “Look, there! The rumors are true,” she said, as the rest of her children gathered around her. This was no ordinary, starving group from Mexico. NO! These were the boll weevil pests coming to look for food and they were hungry! And eat they did and before long, the tiny six millimeter boll weevil insects, ate and multiplied its way across the southern United States during the late 1800’s. 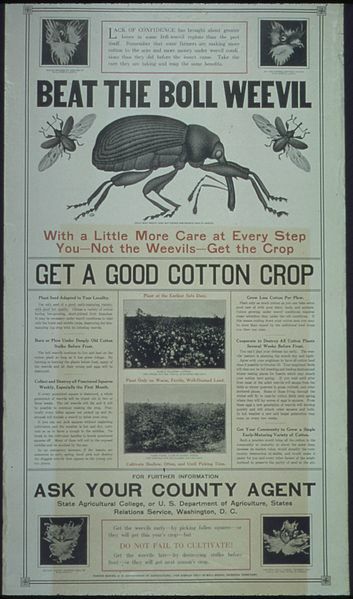 By the 1920’s, the boll weevil infestation brought the United States cotton industry to its knees. As cotton farmers watched their crops dwindle, two Alabama business executives brainstormed ways to find a solution to eradicate the boll weevil problem. They decided to import North Carolina peanut seeds; however, getting the farmers to see peanuts as their future cash crop, a major obstacle. It took one smart Alabama farmer to “look away from the closed-door” and plant a whole acre of peanuts. His sales skyrocketed that year. Had the boll weevils not cause such an agricultural turmoil, Alabama’s cotton farmers may have missed the opportunity to see the profitable peanut farming industry. In appreciation to the little pesky bug for being a catalyst for change, a monument, monitored by a security camera due to repeated vandal attacks, honors the miniscule, yet powerful crop-damaging bug, the boll weevil. 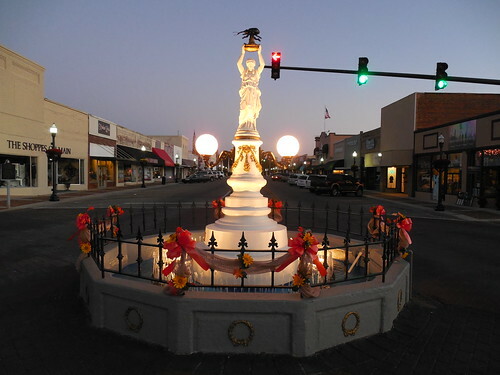 The resin statue replica holds up a boll weevil in the central business district of Enterprise, Alabama. Visitors can find the real statue in a museum nearby. We’ve come to the end of the virtual Boll Weevil Monument tour, hope you enjoyed my mini-version on American historical trivia. Let the tiny boll weevil problem remind us to be ever grateful for good opportunities that come with difficult changes.